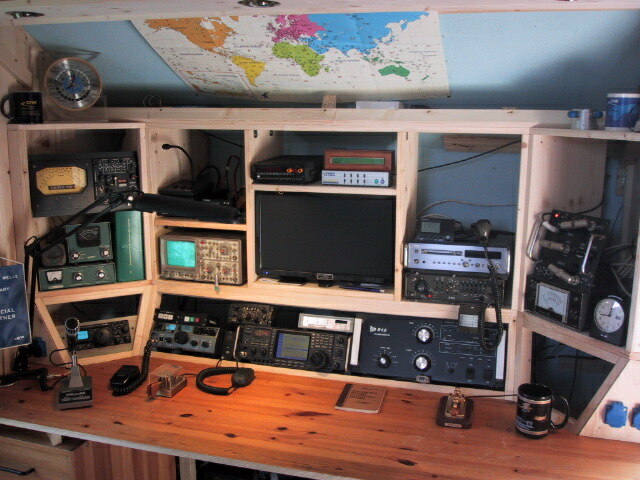 This page is devoted to ROARS members who wish to add photographs of their Amateur Radio Shacks, and also any relevant information which would aid other members in the hobby. This could include advice on gaining planning permission for aerials, and also aerial design for the small garden, to which transceiver to buy. 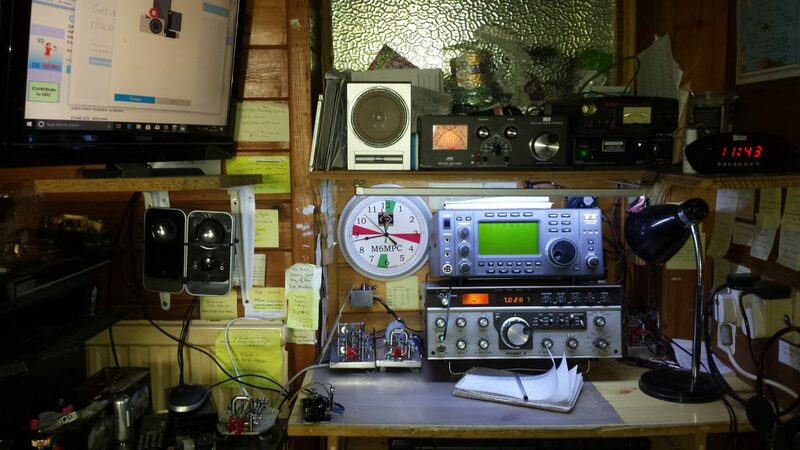 Juergen Wagner has kindly sent in a photograph of his “Interim” Shack. The final solution shall be that all the holes are closed, and from that time he will stay on the air every day and no tinkering – only when absolutely necessary. The transceiver and power supply are in situ only to get the spacing right and allow me to plot where aerial leads etc can be routed. There is much outside work but that is subject to weather and hopefully when I can to a small amount of tree pruning done and plan the transmitting aerial. It is not a large room and there are four computers as I keep two old ones running with XP and Windows 2000 because of certain bits of hardware that won’t work without an ISA slot. Happily my old ICOM PC-1000 and it’s software is now working fine with Windows 10 with a USB/Serial Port converter for the newer computers (serial ports are rare these days and non-existent on the laptops,) so I might be able to remove one of them. Hence my ‘chaos’ statement on the posting. I know it looks a mess right now …. Well …. It is a mess right now, but hopefully order will emerge in time. I am in the process of putting together an Amateur Radio Shack as even though I’ve had a licence for over 30 years, I’ve never actually carried it through. 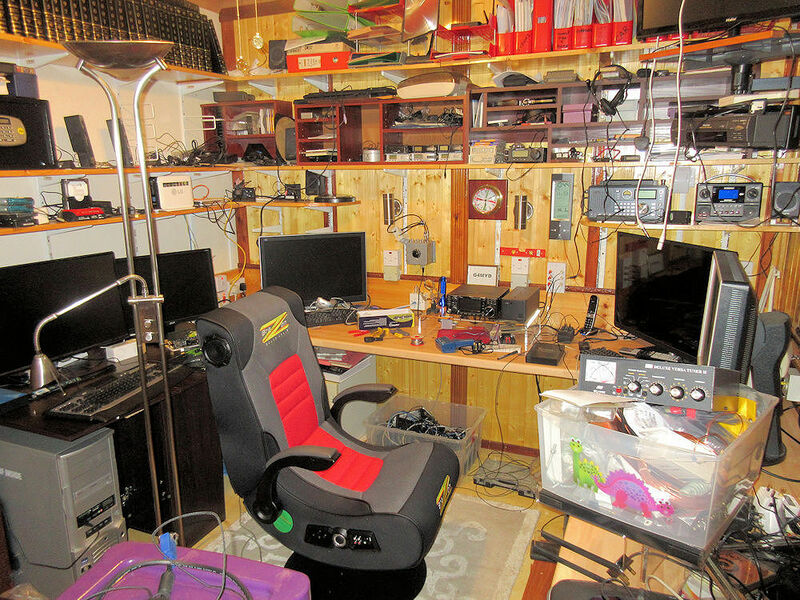 So with a large amount of thanks to Ebay I’m in the midst of a chaotic revamp of my computer room to accommodate the radio station. I was going to put up a photo of this interim period for a sort of ‘before and after’ shots, but I’m afraid I can’t figure out how to do that on here. Anyway the biggest problem is making a hole for the kit to go, which is complicated by the aerial feed ins, but I think I’ve got that part figured out. If you send me the photo I can put it up on the web page. Many thanks Geoff I’ve sent you an email. A few spare moments before I do yet another Advanced mock exam. Good luck with your Intermediate exam this week on the 7th Dec. My Full licence exam is on Monday 11th I would like to be positive about a successful result but will admit to pre exam nerves and that it has been twenty long weeks of hard mental effort. My first trip as junior was with Shell on the Daphella GRVE and then on my own with Shell again on the Hyria GSDP running out of 9VG to Siagon at the talk end of the Vietnam war but that’s another story. I tied various call signs from my time at sea for the foundation ‘M’ call sign but had to give up as anything easy on the morse key was already taken and I had to take pot luck with what was allocated which is not so bad. Having just come back to radio after a break of 35 years I’m rather astonished at the quality of morse I hear on the bands. There seems to be an obsession with speed over quality. I hear “B” as a “6” and “V” as a “4”. From the days of our Coast Stations we could often tell who was keying. Each sender using a straight key, had their own sound and not all dots & dashes were the same length. There was a voice, a rhythm to the morse… almost musical. As I listen today all I seem to hear are automated paddles and bugs or even computer generated [which accounts for all the obscure punctuation being sent]. It’s rather like hearing Stephen Hawking reading Hamlet… Is this just me getting older and grumpy or was the quality of morse better “back in the day”? Interested in your post, I past through Brunel in 76/77 when I did the Electronics Dipolma. I am also starting Amateur Radio I did the Foundation in March and the Intermediate in June and thought would stop there. However I did a SES stint with a local club for Armed Forces Day and no less that five chaps said I should do the Full Licence so I signed up for lots of brain pain and working towards the exam doing distant learning course with BBADL. For a hand held I eventually went for the Yaesu VX-6E. I could have gone much cheaper but this one is water proof and a buddy had the software to programme it. I’ve just been looking through the work we did back then: MRGC, CGLI MRRT, DTi Radar, CGLI Telecom Technicians… we certainly covered a lot more and in much greater detail than we need to do now. And so the big question… why does it seem such a challenge now? Age & memory… although I’m pleased to say that the morse is still intact. I passed the Foundation in October & am taking the Intermediate on 7th Dec. I did get a Baofeng UV-5R which seemed to be a common starter handheld but I can’t really make any sense of it. I have loaded a “plug” (I think) but hear nothing. I suspect I may live in too rural an area and be out of range of any repeaters or, indeed, other amateurs. Although it might just be me. I suspect it will go to the Charity shop faily soon. The distance learning course sounds interesting thanks for the tip. Hi, I’m looking for a recommendation for a handheld VHF transceiver… say around the £100 mark. Any suggestions for a suitable transceiver would be most gratefully received. I’ve decided to get the Amateur Licence, having pondered getting one for 40 yrs since I was at Brunel in Bristol. I’ve booked for the Foundation exam in a couple of weeks working with the South Birmingham club. I’ve never used a handheld VHF before and there seems to be a lot for sale and wondered what might be the best to buy. Baofeng handhelds are cheap and work well; they are available from Moonraker/Nevada for example. I have the dual band one as over here UHF is more widely used than 2metres. Pricing is around £30 or so. I also was with Shell in 1969 and 1973 (Hindsia and Murex). Good company. I went with Niarchos after Murex.